Any plans on partying by the pool or beach side with your squad? Do check out this list of bikini brands that will elevate your swimwear styling. And also could make you stand out from all the other ladies. Prettysecrets is the brand that has made its place in the wardrobe of every woman. The brand always makes sure that you get noticed with its complete chic look swimwear. Next time if you plan a beach vacation and would love to splash some water in a trendy way, this brand will help you fulfil your wish in fashion. N-Gal is the brand that offers you with a wide range of swimwear with just a click and also saves your time. This brand provides you with unique designs and friendly fabrics at reasonable prices. Get beach ready with the trending and fashionable swimwear from this brand. Types: Bikinis, Cover-Up Dress, Sarong, Beach Dress, Bodysuit. Nidhi Munim has achieved huge success after serving its prestigious clients in over 10 countries. The brand has also entered in the world of Bollywood and modelling. The Brand comes with a huge collection and makes sure you check out with some fabulous beach or pool wear. With the massive amount of success for over 30 years, Forever 21 is almost every woman’s favourite brand. The brand has many stores all over and provides absolute fashion friendly apparels. Shop the modish swimwear to look stunning on the water side. 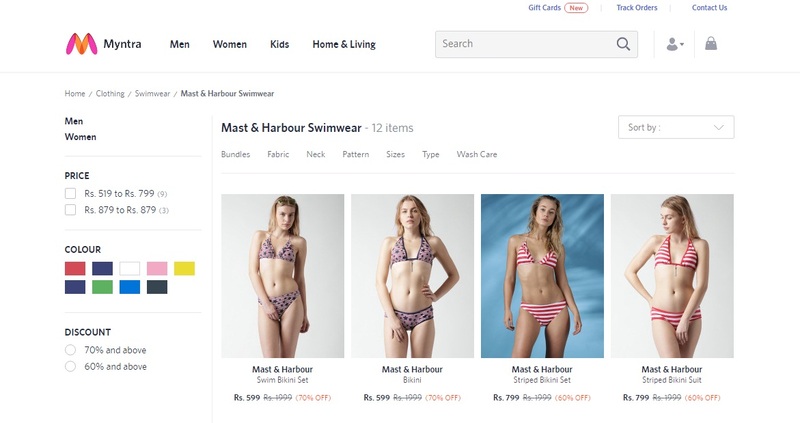 Mast & Harbour is another online brand that serves its beautiful women clients. This brand has a surplus of sassy swimwear. They have bikinis of various pattern, colours, and fabric to tankinis that will definitely make you look stunning. It is a must try brand on the online platform for all the ladies who love to flaunt their curves! Vero Moda was launched in the year 1987 and since then it has been a delighted fashion line. The label has a lot of swimwear types that pamper to all the women’s fashion desires. If you wish to highlight your beach look and drive everyone crazy, then Vero Moda should be your next stop to shop your swimwear. 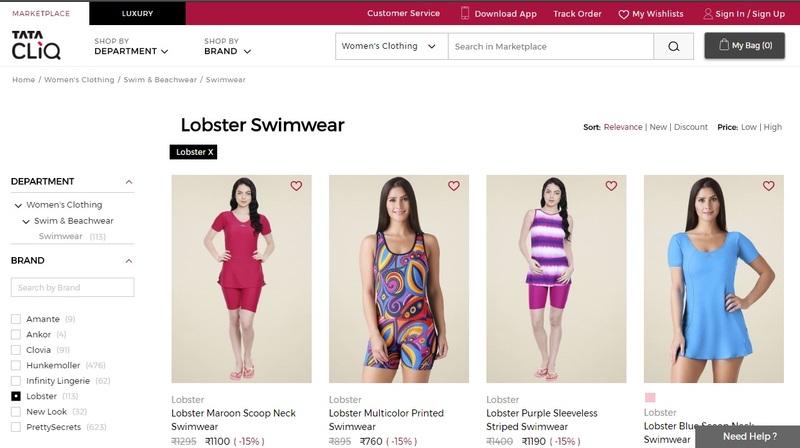 With all these brands to choose from, Lobster holds its position in the list where you can get versatile swimsuits. Next time, play the dress up game with Lobster for a pool party. Shop your favourite swimwear from the Lobster store and grab the most attention at a beach or pool party. Heart 2 Heart was established with a vision to reach not only the close and urban areas but even the remote and rural parts of India. The brand has represented its expertise in providing superior quality fabric and designs in swimwear. 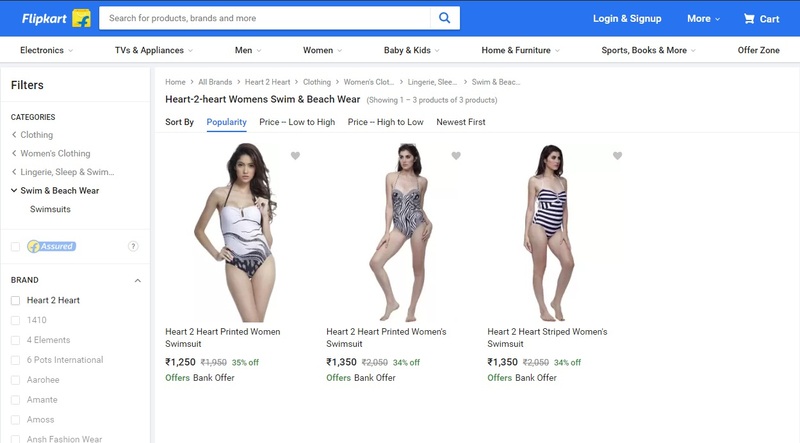 You can definitely try this online brand and shop your heart out. Did you ever have that fantasy to splash some water with style? Then you should definitely try Fasnoya line swimwear. The exclusive range of Fasnoya swimsuits promises for a complete makeover. Grab in Fasnoya beach wear as soon as possible and carry yourself with style and confidence at a pool party. Last but not at all the least another brand on the list that makes sure to elevate your swimwear style marvellously is the JC Collection. You can shop the trendiest swimwear from the JC Collection and be a trendsetter this season. Do not get confused with so many options. Choose the bikini that best suits your body type and the one that makes you feel comfortable and stylish at the same time. Enter the pool party in style!